Vegan Fried Rice with Currants is such a wonderful side dish that you can pair it with any meal. This is a simple yet tasty combination of savory and sweet flavors. The raisin in the picture is one of the most common ingredients that we use in various dishes. We call it kuş üzümü in Turkish. Kuş is for bird, üzüm is for grape. I think it has this name as they are small enough for birds. However, I wasn’t sure how to call them in English. Turkish-English dictionaries say ‘currant’ for it, but when I searched on the net for the visuals of currants, they were totally different from this raisin. Finally Tracey from Tangled Noodle saved me from my confusions and clarified its English translation for me. Thank you Tracey! She says small variety of grapes called ‘champagne grapes‘ are referred to as ‘currants’ when dried. And with the link she suggested, I learnt that “Although it may be confused with common black, red or white currants that grow on bushes, it is similar only in shape and size, but is not the same type of fruit. The dried grape that becomes a currant is often used like raisins as an ingredient when baking cookies and sweets.” So I’ll call them currants from now on. There are small grapes in a bunch of black grapes and they don’t have seeds as they are not matured enough. These small grapes are picked seperately and dried, then they become currants (kuş üzümü). They give a bit sweet taste to dishes. We use it in cakes, cookies and compotes, but in Turkish cuisine, they are much liked in stuffed vegetables and rice pilaf. Tip: To clean currants from their straws, coat them with a little flour, put them in a strainer with big holes. When you shake it, the straws will drop with flour. You see how currants swell in pilaf although they are crinkle before being cooked. They look so cute that I can put them in any dish. To serve it in the shape you see here, wet a small bowl. Fill it with rice and turn it upside down carefully on a plate. Put rice in a bowl, pour 2 cups hot water into it and add 1 tsp salt. Wait this for about 15 minutes. You’ll see how it turns out whiter within this time. Then rinse it well. Heat olive oil in a pan. Add in rice and salt. Fry it for 2 minutes stirring occasionally. Add in 1 teaspoon lemon. Lemon juice helps rice not to stick each other, which is so important for Turkish rice pilaf. Cook it stirring continually for about 5-7 minutes on medium heat. Pour 1 ¾ cups water and currants, stir once and cover it. Bring the heat to the lowest when it starts to boil after about 3 minutes and do not uncover for about 10 minutes until it absorbs all the water. When there isn’t any water left in the pan, remove from the heat. Let it sit for about 15 minutes. Uncover and give it a gentle stir before serving. Frying rice in oil is so important when making pilaf. Otherwise, the rice will be boiled and won’t give the desired taste. When someone asked me what dish I loved most when eating in Istanbul, I couldn’t name it: it’s a rice pilaf inside a pie crust. What do you call that? I go around looking for places to buy kuş üzümü because it gives my rice the turkish flavor I love, along with those little black seeds ( I forget the name of those now.) Now I know how to spell what I am looking for, but I still don’t know how to say it right! I love the way the currants spice up the rice! That’s so creative! I’m sure it’s delicious. I love the addition of raisins to savoury ingredients such as this. Zerrin, I used to be confused by currants and kus uzumu also. Here in the States, most Turkish people translate ‘kuz uzumu’ as ‘currants’. Your translation is correct. The pilaf looks very inviting! Your rice looks great with the plumped currants! A pilaf with currants would be delicious with chicken. Lovely photos! I love currants, and I bet this rice is delicious! Looking at the title i thought its a sweet dish but this sounds delicious, i love currants and raisins in rice! Hmmm, this rice with currants look so yummy Zerrin. I made rice pilaf with garbanzo and lentil last night. It was delish as well. In Colombia we have a delicious side dish rice recipe with coconut milk and raisins. Your recipe sounds and looks fantastic! Mmmm…Looks very delicious and really simple to make. I don’t think I’ve had currants before. I can imagine it with baked goods and desserts. I never would have though to put it with any rice recipe. Neat. I can never get enough of rice! Usually, we eat rice simply steamed, allowing the accompanying meats, fish or vegetables to be provide most of the flavor (although leftover rice fried in garlic is a Filipino favorite). 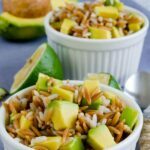 I would like to branch out more with rice and try making pilafs – this is a great recipe to start. Thanks so much for the mention – I’m happy that the information helped! We often use currants in baking here but I’ve never used them in pilaf-type dishes. I do love the combination of rice or couscous with dried fruit, but I usually use dried apricot or golden sultanas. I must try this version with currants sometime! Oyster- Actually, this rice pilaf is one of our common side dishes that we eat with meat or any kind of stew. That’s why no sugar is added. What a great photo. The rice pudding you made sounds delicious and and nutritious. I liked the fact that the only sweetness was provided by the currents themselves and not any additional sugar.